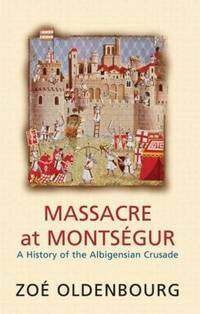 Zo Oldenbourg (Russian: ) (March 31, 1916November 8, 2002) was a Russian-born French historian and novelist who specialized in medieval French history, in particular the Crusades and Cathars. She was born in Petrograd, Russia into a family of scholars and historians. Her father Sergei was a journalist and historian, her mother Ada Starynkevich was a mathematician, and her grandfather Sergei was the permanent secretary of the Russian Academy of Sciences in Saint Petersburg.Her early childhood was spent among the privations of the Russian revolutionary period and the first years of Communism. Her father fled the country and established himself as a journalist in Paris. With her family, she emigrated to Paris in 1925 at the age of nine and graduated from the Lyce Molire in 1934 with her Baccalaurat diploma. She went on to study at the Sorbonne and then she studied painting at the Acadmie Ranson. In 1938 she spent a year in England and studied theology. During World War II she supported herself by hand-painting scarves. She was encouraged by her father to write and she completed her first work, a novel, Argiles et cendres in 1946. Although she wrote her first works in Russian, as an adult she wrote almost exclusively in French. She married Heinric Idalovici in 1948 and had two children, Olaf and Marie-Agathe. She combined a genius for scholarship and a deep feeling for the Middle Ages in her historical novels. The World is Not Enough, a vast panorama of the twelfth century immediately put her in the ranks of the foremost historical novelists. Her second, The Cornerstone, won her the Prix Femina and was a Book-of-the-Month Club selection in America. Other works include The Awakened, The Chains of Love, Massacre at Montsegur, Destiny of Fire, Cities of the Flesh, and Catherine the Great, a Literary Guild selection. In The Crusades, Zoe Oldenbourg returned to the Middle Ages she knew and loved so well. She won the Prix Femina for her 1953 novel La Pierre Angulaire.